2002; 399 pages. Genre : just as many as The Eyre Affair had. Overall Rating : B+. Thursday Next's life has become rather hectic. She's pregnant, and her hubby's been time-napped. Someone is trying to kill her with coincidences. The Spec-Ops cops and Goliath Corp. consider her a liability. Uncle Mycroft has retired and Daddy is still on the run, stopping by only to tip her off that Armageddon is coming in the form of a pink sludge. The primary literary import this time is Miss Havisham, the man-hating dowager from Charles Dickens' Great Expectations. Fforde brings Havisham into the 20th Century and adds delightful depth to her character. She has a passion for anything with a powerful engine, and you are advised not to get into any vehicle that she's driving/steering. Equally engaging is the Cheshire Cat, who reminds me a lot of the orangutan Librarian in the Discworld series. Indeed, LIAGB is rife with literary references - besides Great Expectations, the following are either visited or export characters to Fforde's book : Kafka's The Trial; Alice In Wonderland; Poe's The Raven; and even Beatrix Potter's Peter Cottontail series. Another half-dozen books make cameo appearances. I dare say that Fforde does for classic literature what Disney animated movies and cartoons do for classical music. There is the same zaniness and wit as was in The Eyre Affair, and the same plethora of plotlines. Alas, Fforde seems to have developed Robert Jordan Syndrome. That is, he starts a lot more plotlines than he finishes. The drove me crazy in the Wheel Of Time novels. The ending is a bit contrived, and only ties up one of the loose ends. There isn't a lot of romance here, what with Next's husband having been spirited away to parts and times unknown. Fforde uses a different approach to the classics in this story. There's a lot more time/dimension travel, a lot more classics visited; but no altering-of-endings that I could discern. That's probably for the better, as it opens the door for Fforde's creativeness. 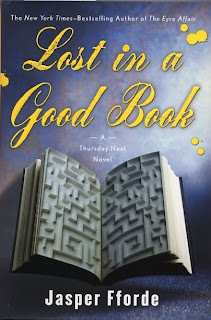 I enjoyed Lost In A Good Book just as much as The Eyre Affair, and since my local library carries all five books in the series, it is likely that I'll read the gamut. Book 3 is titled The Well Of Lost Plots, which is a repository for all those storylines that were thought of, but never published. One can only imagine what the fertile mind of Fforde will do with that. This sounds great! I can't wait to read the next installments. I think I'd really like these books. I'm so glad ya'll like these books! I'm very happy you told me about them Debye. When I'm not so wrapped up in all the books I'm reading for my challenges, I'm going to move forward with this series.